You can make a strong case that Donald Trump owes his victory to the death of Justice Scalia. If there had not been a Supreme Court vacancy to fill, the Never Trumpers at National Review would have had a lot more company. If Clinton controlled that appointment, it would have shifted the 4-4 balance of the Court (the ninth Justice, Kennedy, is a switch hitter) into an unbreakable 5-3 liberal majority. This would have been calamitous for constitutional conservatives. I didn’t vote for Trump because I live in California, and my vote doesn’t really count. If I was in a battleground state I probably would have forced myself to vote for him. Supreme Court vacancies move votes, at least from people like me. I call Kennedy a switch hitter, and that’s not really fair. He’s much more comfortable with his colleague Neil Gorsuch than he is with Justice Sotomayor. And he’s decided to let Trump pick his replacement next summer. His timing is perfect, and all Republicans will benefit, particularly in the Senate. The left is going to absolutely bat guano crazy, because Kennedy is the fifth vote to uphold Roe v. Wade, and abortion rights in general, and his replacement will be the fifth vote to overturn Roe. Which really isn’t that big a deal. Before Roe v. Wade, states had their own abortion laws, and they were evolving toward more leniency. 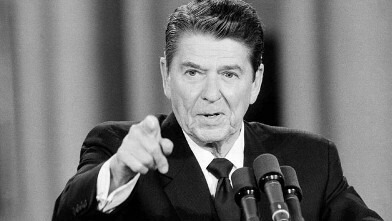 As Governor of California, Ronald Reagan signed such a bill into law. Once Roe is overturned, the states will once again control the laws on abortion within their borders. California will continue to have the most liberal abortion law in the country. South Dakota will probably have the most restrictive, with the rest of the states somewhere in between. There’s enough money in the pro-abortion movement to help pregnant women in South Dakota get to an abortion clinic somewhere, so this isn’t really such an important decision in the real world. Politically, it’s dy-no-mite. Every Democrat in the Senate must, must vote against Trump’s nominee, regardless of how qualified and attractive they are. They have no choice, and it’s going to hurt them. As they demonstrated in the Gorsuch hearings, Senate Republicans know how to conduct themselves with Supreme Court nominations. Cruz and others on the Senate Judiciary Committee will make mincemeat of the Democrats, who have no choice but to be hysterical. Good TV, and bad politics for Democrats. This will help the Republicans in the House, as well. Although, at the rate they’re going they may be beyond help.